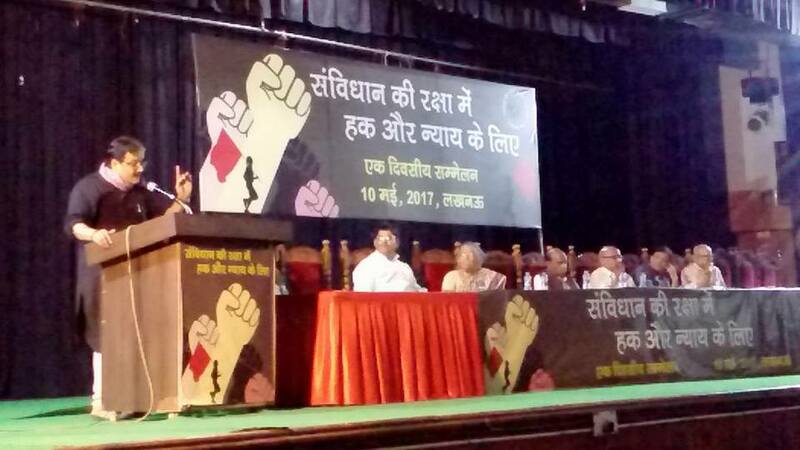 In an unusual show of anti-BJP unity, representatives from Congress, Samajwadi Party, Bahujan Samaj Party, and Communist parties shared a civil society platform in Lucknow, where nearly celebrations took place began on May 10 to mark the 160th anniversary of India’s first war of Independence, 1857. They had gathered for a “national convention for safeguarding the Constitution”. Party representatives who participated the meet, including Arvind Singh Yadav of the Samajwadi Party, Surendra Rajput of the Congress, Manoj Jha of the Rashtriya Janata Dal (RJD), Javed Raza of JDU, Lal Bahadur Singh of the UP Jan Manch, DP Tripathi of Nationalist Congress Party, Ashish Mittal of the CPI-ML, SP Kashyap of the CPI-M, and Asha Mishra of the CPI, pointing towards the need to “support” creation of combined resistance against BJP. Welcoming the civil society efforts for the creation of common platform, the political leaders said, there is an “urgent need” to form a joint front against the politics of the BJP and its ideological parent, the RSS, along more democratic and secular lines. Also Buddha Purnima day, the convention celebrated Gautam Budhha as a champion of human rights in ancient India, even as pointing towards the importance of Buddha in safeguarding the constitution and bringing together social movements across the country against the attack on their constitutional rights. The convention saw Rakesh Bedi, renowned theatre artist of the Indian People’s Theatre Association (IPTA), noted social activist Teesta Setalvad, bureaucrat-turned-activist Harsh Mandar, Saharanpur activist Sanjay Garg, Varanasi activist Deepak Mallick, student leader Ramkaran of the Allahbad University, Lal Bahadur Singh and Rooprekha from Sanjhi Duniya, discuss participation of youth in politics. Speaking on the occasion, young Samajwadi Party leader Richa Singh spoke at length on how attacks were taken place against public-run institutions higher learning such as Delhi University, Jawaharlal Nehru University, Hydebarabad Central University.Singh said, hew Universities Grants Commission guidelines cuts up to 85% of seats at M Phil and PhD. Ramkaran, student leader and activist pursuing law at the Allahabad University threw light on the systematic targeting of Dalit and other marginalized community students. Other speakers agreed on what they called “unprecedented attack on the constitutional rights by the BJP.” Issues discussed included the communally divisive agenda of BJP, blatant saffronization, autocratic, non-democratic methods of working, abuse of power, anti-poor, pro-corporate economic policies, stoking of communal tensions and hypocritical u-turns of the Modi government at the Centre. There was sharp focus on the rise of cow vigilantism, on one hand, and 'depoliticisation' of the youth in the country, on the other, with speakers stressing on the need for mass level political education, especially of the youth, on principles of Constitutionalism, rule of law and the historical learning experiences of national movements. Participants questioned the Prime Minister’s silence on most of the issues, whether it was demonetization, land reforms, train ticket price hikes, scaling down of health and employment opportunities, and so on. Mandar said while one can fight against anti-people discriminatory policies of the government, the silence of people and fellow citizens against injustice, such as the mob attack,s was harder to accept. Pointing towards the 'India Exclusion Report' published by Mr. Mandar's organisation, which is to be released on May 12, he added, it has carefully scrutinized the adverse impact of the BJP's strategy of 'social engineering'.